We lost Freckles a few hours after this clip was taken. Dressy has a young girl riding her right now. Brooke is 16, and is planning to ride her in competition this year. She comes every Sunday to ride (and to clean my barn… which is really quite awesome!). Dressy is a very affectionate mare, and Brooke pampers her. So Dressy is really in love with her girl. Brooke is learning basic clicker training principles. Dressy is of course highly food motivated as well as being affectionate. So they are making good progress. Last Sunday, they worked on trying to get Dressy into a bit of a frame. While she’s lovely to ride in many ways, Dressy is not a naturally collected or supple sort of horse. 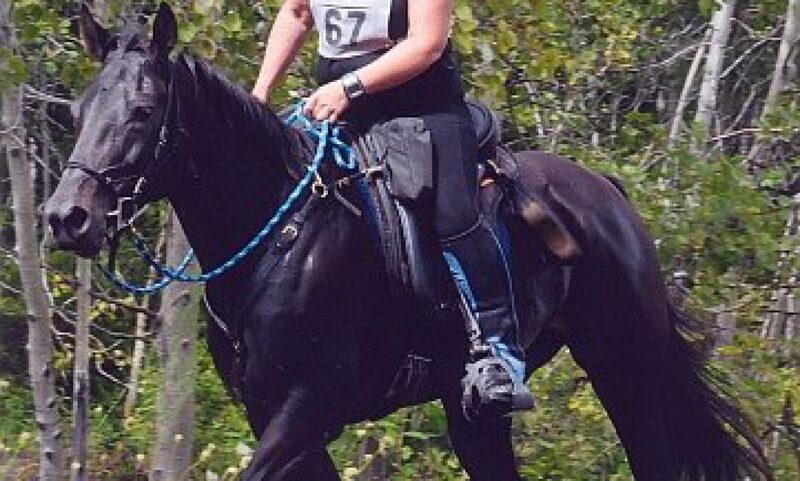 She’s a Standardbred who raced for quite a few years. So she raced in an overcheck on the pace (a gait similar to a trot but a bit faster). Which means that she tends to want to carry herself with her head up and her back hollow. That’s the opposite of what you want to see (or feel) in a riding horse. A horse who is hollow like that doesn’t bend well either, which makes them something of a hazard to your knees if you are riding on a winding trail through trees. She has improved a lot over the last couple of years, but having the last year off has allowed her to revert somewhat. The trails were (and still are) just awful out there right now. Ice and mud. Still. So I told Brooke she could ride Dressy in the round pen and work on basics. Circles and suppling exercises. The footing is slippery, so it all had to be at a walk. Then I looked out to see that she’d started clicker training her to put her head down and walk in a frame. Dressy was very enthusiastic about it all and got herself a bit overbent on occasion. But it was obviously a happy and productive day for both of them. Brooke was glowing at the end of the session, totally impressed with Dressy’s brilliance. And Dressy just looked smug. And full. The foals are all doing very well now. The orphan has tentatively been named Reno. One of his older brothers is Vegas, so it’s rather apt. He has a ton of personality. Or perhaps just an enormous ego with all the attention he gets. He does a little hungry dance at the door of his stall and nickers wildly whenever he sees or hears any human within range. He’s a bottomless pit. Not sure how many bottles he’s drinking in 24 hours, but Linda counted 27 during the day yesterday, which doesn’t include the night shift. She is spending most of her day purely as a milk assembly line for him. He does have a bit of diarrhea, and we fed him some probiotics this morning. He did NOT approve of the flavour. And wow… he sure tells you how he feels. He was MAD. Bucking and spinning and trying to kick me as I left the stall (I wasn’t moving too slow either!). The little filly has been named Esmerelda. She was cute when she was born, as all foals are. But she’s gorgeous now that she’s filled out a little bit. This filly is by far the most athletic of the three foals. She did a series figure 8s today around the pole at the center of the arena and her mom that were just lovely. Then she got excited and did flying lead changes, including some on every stride. Canter, canter, change! canter, canter, change! canter, change! change! change! canter. And every stride was perfect. She’s a little saucepot too. Al, the chestnut colt has really come along. He was really quite stupid the first few days. But he’s perked up a lot and is now much brighter and more aware of everything around him. Today he stretched his legs in the arena and really ran. He doesn’t have Esmerelda’s agility and lightness, but he’s going to have a big, powerful stride and appears to be quite fast. And he’s very handsome now. I keep meaning to take more pictures, but I just haven’t had much time. I will try to take more over the next few days. Freckles’ colt is doing very well. He doesn’t have a name yet, so I’m just calling him “the Kid”. He eats like a… well… a horse. He just keeps sucking back bottle after bottle. There was never one moment of hesitation from him about what it was or how to operate it. We stuck that bottle in his mouth and he downed it. No problem. I expect we’ll be able to switch him to a bucket quite easily. When he’s hungry he lets us all know at top volume. At the farm, we got her set up in a temporary stall outside the foal’s stall. She was a bit scared of him at first. I don’t think she’s ever seen a baby before. She made faces at him, and nipped him once. But since then she’s gotten steadily friendlier to him. He loves her already. When she moves off to the side of the door and gets out of his sight, he worries and calls to her. So we are all hopeful that it will work out. With any luck, she’ll help to socialize him to horses, and not so much to people. And teach him manners when he gets a bit older and ruder (as boys do). The other two foals are also doing very well. Exclusive’s filly is amazingly smart and physically very agile. She’s not overly big. But she was up before the mare after she was born, and was able to trot a few steps within a few minutes after getting up. 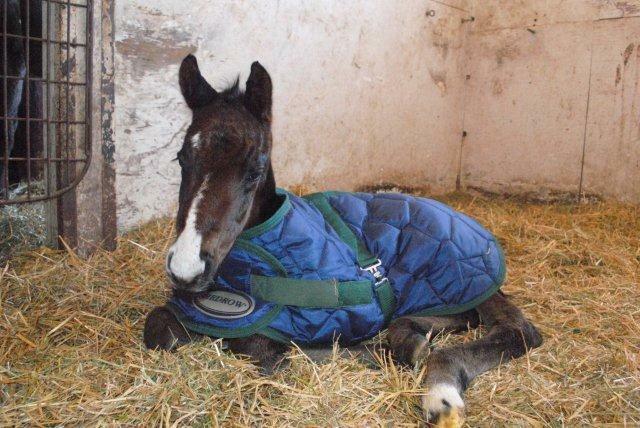 Within 24 hours, she was trotting and cantering laps around her napping mother in the stall. This morning she was practicing her bucking (the boss was especially happy to hear that). And this afternoon she was working on her flying lead changes. By tomorrow I’m sure we’ll see the first stages of piaffe. The chestnut colt is very leggy and is a lot handsomer than the first photos show. But I must admit he’s not quite so smart as the other two. We have trouble getting him to go anywhere with his mother. There’s quite a bit of foal wrestling to get him to move along. Bernice, his mother, is not quite so obnoxious as she was the first day. So I’ve stopped calling her rude names. The kindest and gentlest of our mares, Freckles (Fresh Believer), had complications about 12 hours after her colt was born. She was gone before the vet could arrive. She was a lovely mare in every way. A solid, handsome mare with huge, liquid eyes, and a quirky wide freckled blaze. She really never did a bad thing in her life. She loved people and everyone who ever met her loved her right back. And now we have an orphan foal to take care of. We’re looking for a nurse mare. Here are the photos. Freckles colt first… a bay with an off-center star and long strip. Then Exclusive’s filly… a bay with a big star. Then Bernice’s colt… a chestnut with a narrow blaze. Oh. My. God. We had three foals in 10 hours at work. That is… all three of the mares we had due this year.. all foaled the SAME day. First came Freckles at about 5:30 this morning. Then Exclusive foaled without anyone noticing… out in the run in shed around lunch time. I found them a few minutes after the filly was born and we scooted them both into the barn. Also brought in Bernice. Lucky thing. Because Bernice foaled two hours later. I am working on uploading pics. Just got a text from Linda. Freckles has a boy (again! poor mare). I will take my camera and put up some pics this afternoon. I am a big fan of keeping horses outdoors. I have a small barn with a few box stalls. But I’ve converted the end of the barn into a run in area. I keep the stalls for injured or sick horses, etc. My Standardbred mare ought to be a hothouse flower, since the extent of her turnout for the first six years of her life was being put in a paddock once a day for half an hour while her stall was cleaned. But she’s quite a tough cookie. Rain, sleet, blowing snow, freezing rain… she is perfectly happy out there. And it’s not that she doesn’t have access to the run in. She’s a very dominant mare, and all other horses bow before her magnificence. King, on the other hand, who has lived outdoors his whole life, is another story entirely. He adores his stall. When he was still a youngster, he used to rush into the stall whenever he got a chance, fling himself to the floor, nestle into the bedding and close his eyes tightly. If I went over to see if he was okay, he’d open one eye and glare at me, “Don’t bother me! I’m sleeping!” Then he’d close his eyes and start snoring within a few minutes. He’s rather prone to colic in the winter. I tried a few different strategies to manage it. Warm water to drink, sloppy beet pulp, etc. But none of those things really helped. What did help, was letting him tell me when he wanted to come in for the night. He comes in to have his dinner (a handful of wet beet pulp) and then he tells me how he feels about the weather. His opinion is easily read. If he wants out, he’ll stand at the stall gate. If he wants to stay in, he gets kind of a smug look on his face, and settles in happily facing his hay corner and gives me an expectant look and a nicker. Resistance is futile. King has a rather unique ability to radiate his thoughts and wishes to everyone in range. It’s so bad that at rides I have to watch the passers-by, and even good friends (!!) to make sure they don’t start feeding the sad, starving (fat!!!!) horse when he nickers low and seductively at them, then stares meaningfully at the nearest hay bale. The weather was awful today. Lots of snow, and much colder again. I am so so ready for winter to be over. The footing is actively dangerous on the trails (big sheets of ice), and the paddock is turning to muck. King was very definite about his preferences for his stall tonight. So he’s cheerfully munching hay indoors. Don’t they say that endurance horses should take good care of themselves?